Rajesh Jha will lead a new team focussed upon Experiences & Devices. Devices will to be lead by Panos Panay, promoted to Chief Product Officer. Scott Guthrie will lead the new Cloud + AI Platform group. Windows Experiences will continue to be lead by Joe Belfiore. New Experiences and Technology: Kudo Tsunoda will continue to lead this team. Enterprise Mobility and Management: Brad Anderson will continue to lead Microsoft's Windows Enterprise deployment and management efforts. Jason Zander is being promoted to executive vice president, Azure, and will lead this team. He will look over the Windows platform team led by Harv Bhela, Henry Sanders and Michael Fortin. The above is part of a wider Embracing Intelligent Cloud and Intelligent Edge shake-up announced by Microsoft CEO Satya Nadella on the official Microsoft Blog yesterday. 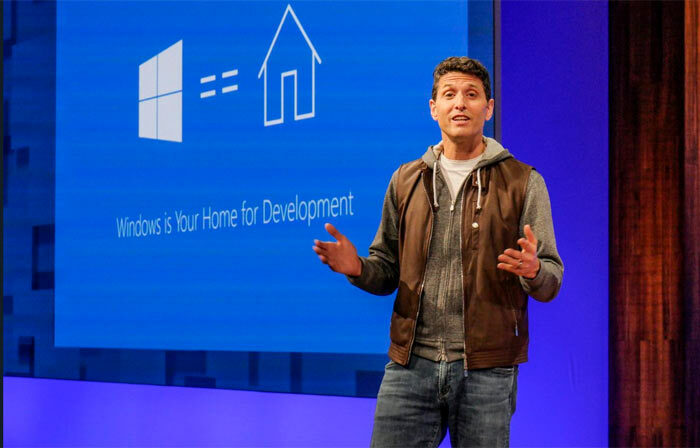 As the WDG fracture plans were being drawn up, Nadella says he consulted with 21-year Microsoft veteran Terry Myerson about the new company structure. They also talked about Myerson's plans after the transition completes (and the significant changes will be smoothed thanks to Myerson's cooperation over the coming months). 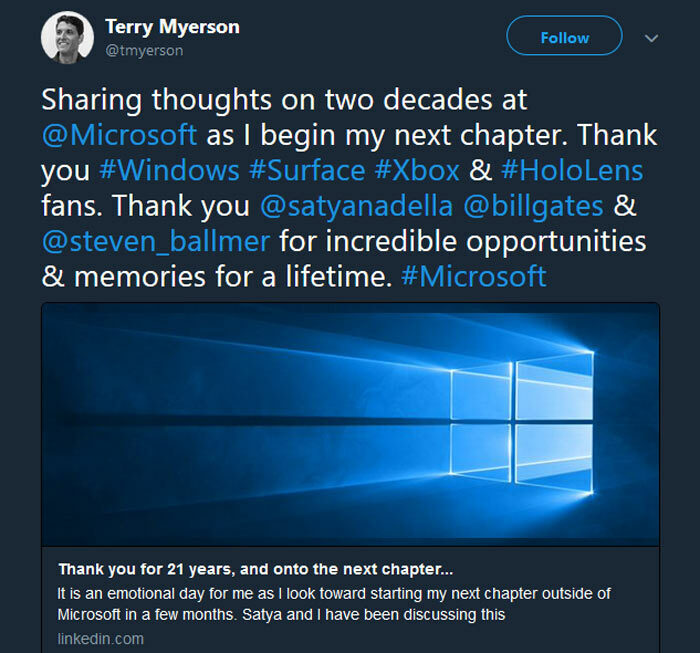 If you'd like to know more about Terry Myerson's work at Microsoft and his plans for when he leaves, you can read his lengthy LinkedIn post entitled "Thank you for 21 years, and onto the next chapter..." The Myerson story begins with his first meeting with Bill Gates in 1996, through his years on the Microsoft Exchange team, passing over the time where Myerson headed up the Windows Phone team, and then discussing the most recent period he enjoyed at Microsoft as head of WDG. Myerson will leave Microsoft with Windows 10 approaching 700 million users, Xbox One running a Windows 10 core plus Surface and HoloLens looking good as devices pushing innovation. So what will he do after the transition period completes? He says he wants to train up for an Ironman competition, learn to play guitar or piano, learn more about genomics and robotics, and spend some more quality time with his wife and children.